As Pride celebrations continue to rage on across the globe, members of the Fab Five from Queer Eye joined in the fun at a special Florence and the Machine concert. The show in New York City dubbed "From Your Flowers Grow" was an exclusive performance for the group's top Spotify Premium fans, and Jonathan Van Ness, Antoni Porowski, Karamo Brown and Tan France were among the intimate, candle-lit crowd. 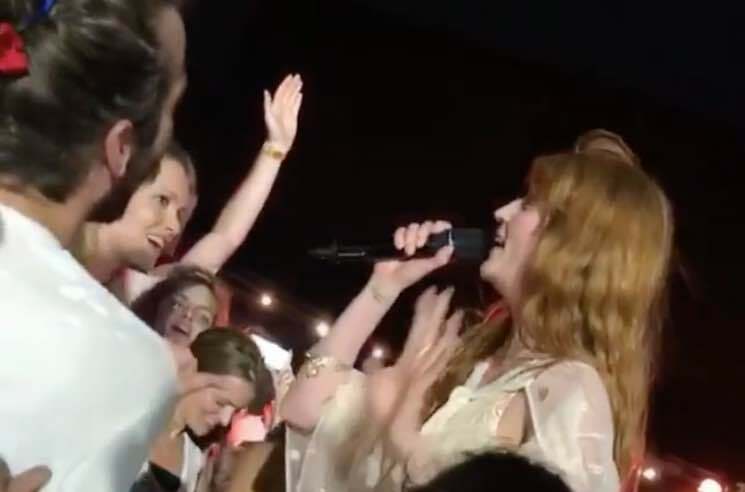 The excitable group understandably documented the up close and personal performance by Florence Welch and her band. Check out some of the front-row video and photographic footage below captured at the show in the lot behind NYC's Greenpoint Terminal Warehouse. Florence and the Machine's next album High as Hope is due out June 29 via Republic Records. It is available to order on vinyl via Umusic. Meanwhile, Season 2 of Queer Eye is streaming on Netflix right now.